Lots of room for my m18 tools batteries and chargers. Seems well made. The handles and tie downs work well. I had to put the set up in the back seat of the truck as the handle doesn’t fold low enough to go under the tonneau cover. But so far so good! The 3 piece Packout is awesome. In a very short time I have increased my productivity and organization of all my tools. The Packout is amazing and CPO has great customer service and very quick shipping. I will always use CPO. Very handy for the various job sites I work at. I sometimes work downtown and most often have a long walk to the job site. Since I purchased the Packout system I have not had any problem of cases shifting or coming apart. The cases all lock together and are very stable going up and down stairs also. There are plenty of places to tie down cases while in transit. I like how you can open one case reach in and grab a tool without separating all the cases from each other. Note you cannot open the bottom lid if there is a case above, the handle will not allow it to open. I have not had it very long but so far so good. Love almost everything about the box set. The one drawback is the tote trays. They fit nice but have very little support around the edges. The second flight I took my boxes on the lips of both trays cracked. I called Milwaukee and they are sending replacements free of charge. I'm hoping that a little thicker material will be used. Other than that they draw a lot of attention and questions about how I like them. 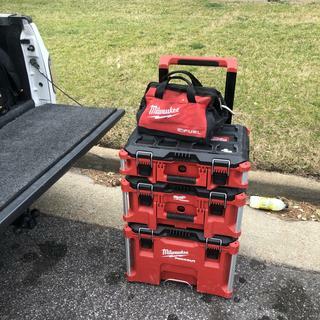 The Milwaukee pack-out tool boxes are great. I replaced all the tool bags and now have 2 roll boxes with 8 more boxes of different sizes to carry every thing Love how easy they are to roll around to where I am working. I will continue to add more boxes and as I continue to add tools. Love the Pack Out System!! Absolutely love the packout system. When we are installing it’s great to have everything we need handy and right where it should be. does the packout kit have any warranty? BEST ANSWER: The pack-out kits will have the Milwaukee limited lifetime warranty. Is the packout new or refurbished? BEST ANSWER: The pack-out Model MILN482284264822842548228424-B is a new kit. BEST ANSWER: You just place them on top of each other favoring towards the handle side one at a time then give a slight push then you hear a click.Now it is locked in.To unlock hold the black button down by the front handle then slide toward the front. You just place them on top of each other favoring towards the handle side one at a time then give a slight push then you hear a click. To unlock hold the black button down by the front handle then slide toward the front. BEST ANSWER: They would be okay in a light shower, but the lids don’t have a gasket. If they were immersed, your tools would get wet. The bundle is not waterproof. The bundle will have the IP65 Rated Weather Seal. Do you have this in all black? BEST ANSWER: No, the item is only available in black and red. What does the limited warranty actually cover on the rolling tool box? BEST ANSWER: Your question will be best answered by the manufacturer, who can provide you with the accurate information. The number to reach the agent is 1-800-729-3878. How strong is the handle and do they have a weathertight version available? BEST ANSWER: The handle is strong, the manual does not list any information about the handle. Unfortunately, we do not offer a different version of the handle. Are any of the packouts being backordered? BEST ANSWER: We show all parts of the bundle in stock. does this come with liners or foam inserts for tools? BEST ANSWER: The kit does not include the any foam inserts. The kit will include the Interior Organizer Trays. Does Milwaukee still make 14 amp batteries for the 14amp drill? BEST ANSWER: You will have to contact Milwaukee directly at 1-800-729-3878 or online at www.milwaukeetool.com . We do not stock the 14 amp batteries.